Compiere Enterprise is a modern, highly adaptable, enterprise-class business solution - that can be deployed on-premise or on the Cloud - for a fraction of the cost of traditional ERP systems. Improve agility and dramatically lower cost of ownership with Compiere. Compiere delivers a broad and rich set of integrated business functionality on a global-ready platform. 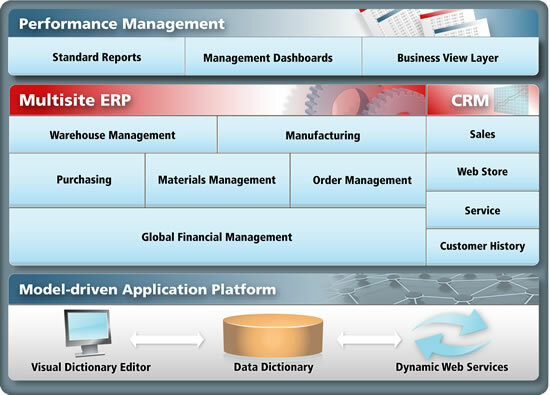 Manage any number of organizations, warehouses, languages, currencies, and accounting rules. Utilize role-based Management Dashboards with drill-down capability to effectively monitor and analyze your operations. Pre-built charts and graphs are provided and are easily expanded to meet your specific needs. And, Compiere Enterprise is built to scale - supporting multiple servers, large transaction volumes, hundreds of users and business complexity required by demanding businesses of all sizes. Compiere's revolutionary design enables applications to be easily customized and extended "without programming" - a first in the ERP industry. Applications are defined as objects in an Active Data Dictionary. Changes are easily made using a modern "drag and drop" Visual Dictionary Editor. Your IT staff will easily embrace the techniques required to extend Compiere. Compiere's innovative design reduces the cost and effort associated with upgrading business applications. Compiere's Automated Upgrade Technology enables seamless migration to new software versions while preserving all Dictionary-based customizations, saving significant time and cost compared to traditional systems. Compiere offers a highly interactive, web-based user experience while providing secure access from any web browser. Integration with other applications is easy using Compiere's service oriented architecture (SOA) and web services. Leveraging open source technology helps reduce IT infrastructure costs. And, access to application source code reduces vendor dependence and project risk. Compiere gives you the choice to deploy your applications in your own data center or on the Amazon Cloud. Amazon's Elastic Compute Cloud provides a professionally managed computing infrastructure over the internet that is private, secure and scalable on demand. Compiere disrupts the traditional cost structure of acquiring, deploying, and maintaining ERP systems. Compiere is available without up-front license fees, and can dramatically lower annual operating costs - saving up to 80% in total cost of ownership. You gain cost savings and flexibility - without vendor lock-in. With Compiere, you are in control but not alone. Your customized solution is backed by Aptean and the Compiere Partner Network who offer a range of services to ensure your success.